It’s the corporate/state media that effectively calls the shots when it comes to national decision-making in the UK these days, so most people assumed that the Remainers would win the previous day’s vote on whether or not the country should remain in Europe. The pre-voting propaganda was so solidly devoted to the “immigration problem,” that nobody considered the implications of actually exiting from the EU should the Brexiters win the vote. In fact, it just added to the confusion, the results of which are all too apparent now, with pro and anti at each other’s throats. And all of it, engineered. It’s perfectly clear that the mass of people wanted to send a message to the old, established, austerity-committed government of David Cameron, that they don’t want him, they don’t want what he does, they don’t believe in any of this. They believe that the leadership of the European Union, what is crushing Greece, etcetera, is not something they want to be part of. They feel victimised by all of that. And the Brexit vote gave them a chance to say no, we don’t want it. Sure, there were racist elements and anti-immigration elements. That’s part of the British political scene. Of course it’s going to play its role, seeking its objectives as part of this. The BBC’s propaganda campaign in favour of remaining had been as relentless as their attacks on Jeremy Corbyn since his election as leader of the Labour Party almost a year ago. So it seemed almost logical that, in a bizarre inversion of reality, that he, not Cameron, is the one they, and the rest of the media, would blame for Brexit. Reading what passes for news this past seven days, you’d never know that the real cause of the upset was the Tory Party, which, aside from Cameron’s resignation, has barely been mentioned; for the reality is that it was an internal spat in the Tory Party that started the whole Brexit ball rolling. Instead, the Remain camp feels they’ve been cheated out of victory by their Brexit opponents – wrongly labelled as a bunch of Nazis and xenophobes. This is exactly the way the BBC has been portraying events: images of angry Remainers demonstrating outside Parliament, contrasted with interviews of penitent Brexiters, who have seen the “error of their ways” and wished they’d voted with their ‘internationalist’ brothers and sisters. So no problem taking in the refugees then? Initially this was going to be a kind of blow-by-blow diary of the vote and its dramatic outcome, but it’s two stories: one about the UK as a broken capitalist state and its relationship to the EU; the other, much more important story, of the attack on Jeremy Corbyn by his enemies inside and outside the Parliamentary Labour Party in an conspiracy to remove him as leader of the party. Attempts to unseat Corbyn have been supported by Left Foot Forward Ltd, a company set up by Will Straw, which runs the country’s ‘No. 1 left-wing blog’ of the same name. Straw is the son of Jack Straw, who served as Home Secretary and Foreign Secretary under Tony Blair. . . . Will Straw is ‘among a network of longtime Blairite stalwarts trying to re-found the Labour Party – a project demolished by Jeremy Corbyn’s landslide victory in the Labour leadership elections in September 2015. For a large part of his career and throughout his time as prime minister from 1964 to 1970 and again in 1974-76 Wilson was the object of a smear campaign that emanated from the British security services and the CIA. They fed material to the press that appeared to substantiate the view that he was a Soviet agent who had been put in place after the KGB had supposedly murdered Labour leader Hugh Gaitskell. In the course of the documentary, the Daily Express defence correspondent Chapman Pincher unapologetically admitted his part in spreading those rumours. The political class sees Corbyn as a danger, although we are constantly told that socialism is so passé, so 20th-century? So what’s the panic? Why the demonisation of this man, if he is so ineffectual and seemingly from another era, with his scruffy clothes and his vaguely subversive and quaint ideas about not wanting to drop atomic bombs on people? Just what is it that the elite are so afraid of that such venomous dirty tricks should be used against him? 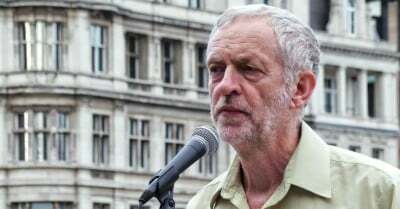 The truth is that Corbyn’s election woke up a sleeping giant – not just those few percent who tipped the balance in favour of Brexit, but the millions of working people who have had enough of austerity while the richest one percent get even richer. They voted not so much about leaving the EU as in giving the government a black eye in the only way they could (what does this tell us about the current state of of the Labour Party, never mind the Tories?). In any case, given the nonsense both government and media have been talking about for the past couple of months, how could anyone come to the right conclusion based on so much disinformation and outright lies? So what should Corbyn do? Or is he just going to turn the other cheek to the vicious attacks being made on him? The second assault on Corbyn (after the carefully timed shadow cabinet resignations), a vote of no confidence passed by 170 Labour MPs (with 40 in his favour), has no legal basis, but is merely an opinion. The only way to attempt to remove him is to call for an election which, I believe, requires the signatures of 50 Labour MPs. Fine, let them run a new election, they have the numbers. But it’s an election, which according to a YouGov poll, Corbyn will win all over again, and by much the same margin. As I write, Angela Eagles, one of his former shadow cabinet colleagues, in a traitorous move, has been persuaded to stand against him. But she was roundly trounced in the election that made Corbyn head of the Constituency Labour Party last year, collecting just 16.9 percent of the votes against Corbyn’s 60 percent. In fact, Corbyn was so popular with rank-and-file Labour supporters that he got more votes than all the other contenders combined. Now he has to live up to the faith those voters put in him, but it’s an uphill struggle with the combined weight of the Establishment, the media and his own colleagues in Parliament, out for his blood. Corbyn has, in my opinion, only one chance of success and that’s if if he steps outside the straightjacket of Parliament and works directly with his supporters. Perhaps ultimately, this might mean splitting the Labour Party in two (and not for the first time) but I doubt Corbyn has got the bottle to do that. It is, after all, an Institution. But as far as I’m concerned, it would be no great loss, in fact I view the Labour Party as an obstacle to real progress. This is, after all, one of those extremely rare moments in our lives, when things change radically. A dislocation if you like, or revolution even, which is why I wonder whether Corbyn has the bottle or not to take a step into the unknown? 52% did, even if they didn’t know it at the time due to our devious and lying media. Of course, there’s still no guarantee that a way won’t be found to either neutralize, reverse or rerun the Referendum, now that the awful reality of a Brexitized UK has sunk in. Awful, because that’s the way the elite want it to be and demonizing Corbyn as its cause is an essential part of it. The issues go to the very heart of a broken economic and political system, not just our place in Europe. The next few weeks are critical. And if this was not enough to raise the country’s blood pressure, next week we see the publication of the long-awaited (by some at least) Chilcot report on the Blair government’s murderous and illegal assault on Iraq. A report that has been delayed over and over again and is now more than two years past its original publication date. Will it change anything? It all depends on its content, but which by now will have been well sanitised of anything truly incriminating for our present or past political class. But it adds to the overall sense of unease that permeates the country at this critical juncture in the downward spiral of capitalism.